This dashboard scans all time frames(M1,M5,M15,M30,H1,H4,D1,W1,MN1) and shows up trend and down trend for MACD, PSAR, RSI, STOCHASTIC, MOVING AVERAGE, BOLLINGER BANDS by changing the colours of the relevant boxes. It also shows candle stick pattern such as PINBAR, ENGULFING and current candle raising or dropping. The default color for up trend is blue and down trend is red. 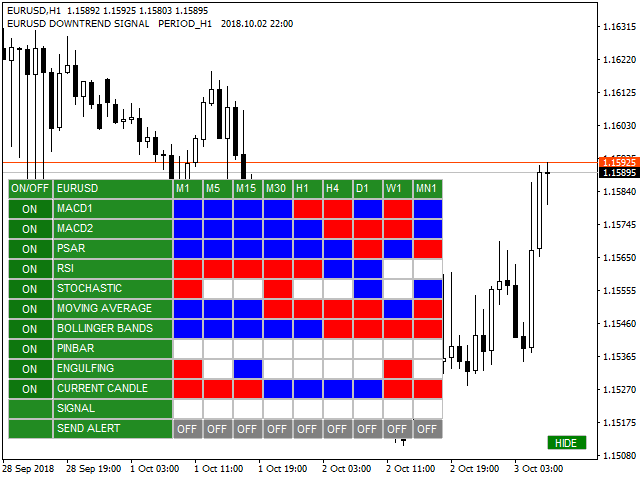 · INDICATOR ON/OFF BUTTON: click the button to select which indicator and candle stick pattern to activate. · SEND ALERT ON/OFF BUTTON: click the button to select which time frame to send signal for pop-up desktop alert and note a comment on top right corner of MT4 screen. · SIGNAL: all the selected indicators and candle stick must be of the same color for signal to be up trend or down trend. 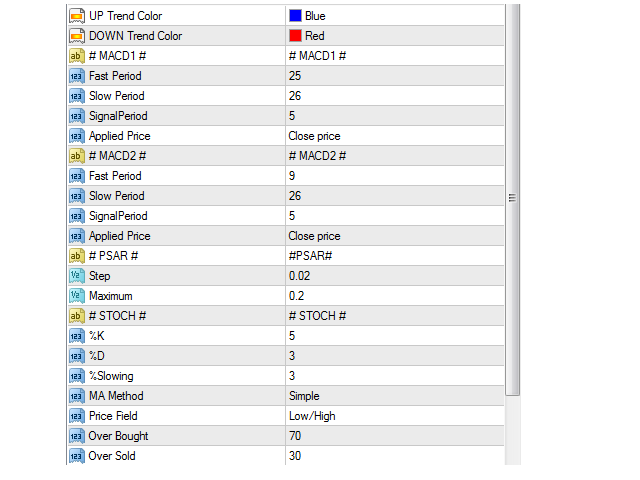 · STOCHASTIC: main and signal line above OVER SOLD is down trend and below OVER BOUGHT is up trend. · MOVING AVERAGE: candle closed above MA line is up trend and below is down trend. · BOLLINGER BANDS: candle closed above mid band is up trend and below is down trend. · PINBAR: bullish candle with long lower wick than body size is up trend and bearish candle with long upper wick than body size is down trend. The length of long wick must be longer than its candle body by a certain ratio. · ENGULFING: bullish engulfing is up trend and bearish engulfing is down trend. · CURRENT CANDLE: Unfinished candle with rising price is up trend and dropping price is down trend, relative to open price of each time frame. 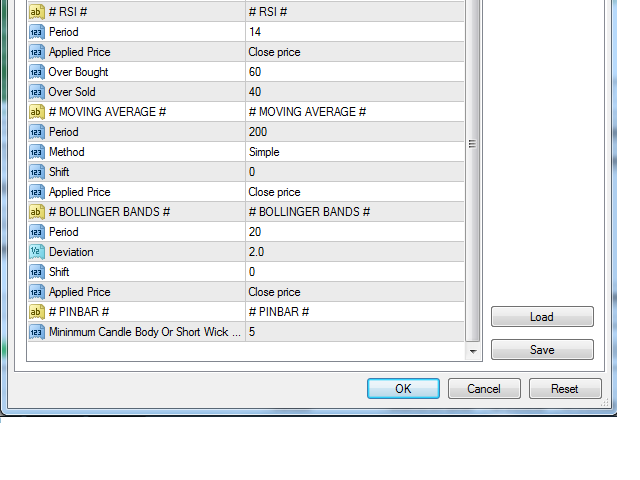 All the indicators parameters for MACD 1, MACD 2, PSAR, STOCHASTIC, RSI, MOVING AVERAGE, BOLLINGER BANDS and PINBAR can be changed as of your preference. This is a very useful tool, it would be even better if it covered all 28 pairs!